Hundreds of people were evacuated from flooded homes Monday and refrigerators and trucks floated downstream as a fierce nor'easter drenched the Northeast with record rainfall, knocking out power to hundreds of thousands of homes and businesses. Nine deaths were blamed on the huge storm. "The huge storm is barely moving so the entire region will remain stormy for days," says CBS News meteorologist George Cullen. Washouts, flooding, mudslides and fallen trees blocked roads. As waves pounded the coast, boats sank at their piers in Maine. Nor'easters form when a low pressure system travels up the eastern seaboard sucking in cold Canadian air and warm moist air from the south, reports CBS News correspondent Nancy Cordes. Suburbs north of New York City were among the hardest hit. Mamaroneck resident Nicholas Staropoli said a truck near his home "actually floated up on the riverbank." One person died Sunday night in Woodbridge, N.J., when a family of four apparently drove past barricades blocking access to a flooded underpass, said police Lt. Thomas Gennarelli. "Three of the occupants were able to get out, the fourth wasn't," Gennarelli said. Residents in at least one New York City neighborhood paddled through streets in boats. The Saddle River overflowed its banks and put downtown Lodi, N.J., under several feet of water. And in suburban Mamaroneck, Nicholas Staropoli said a truck near his home "actually floated up on the riverbank." Rain was still falling Monday morning in the New York area and New England after it began early Sunday along the East Coast from Florida to New England. By afternoon, it was light and intermittent. "It was a long commute today, roads closed, flooding roads, rivers that weren't there before coming across the roads!" John, who commuted into New York City, told CBS News' Marc Adams. Mamaroneck police and firefighters spent the night rescuing residents from 60 to 70 homes, said Town Administrator Stephen Altieri. More than two dozen National Guard members used trucks and Humvees to help evacuate low-lying sections of the town. Firefighters plucked Kathleen Reale and her twin boys from their window in suburban Mamaroneck using a front-end-loader. Water reached up to her knees in her garage and basement and her family was evacuated to a shelter. "I mean everything will be ruined," she said Monday. "Everything will be gone. It's unbelievable." The shelter was filled to capacity Monday morning with about 300 people sleeping on cots. Mamaroneck, in Westchester County, called for voluntary evacuations of areas on Long Island Sound. The rain totaled 8.21 inches in suburban White Plains from early Sunday to Monday morning, with 7.81 inches in New York City's Central Park, the National Weather Service said. The previous Central Park record for April 15 was just 1.8 inches, set in 1906. Eliot, Maine, got nearly 7 inches. Snow fell in inland areas, including 17 inches in Vermont. Wind gusts to more than 80 mph toppled trees on highways in Maine. New York had activated 3,200 Guard members to help with evacuations and New Hampshire sent 200 to hard-hit towns. The Connecticut National Guard supplied amphibious vehicles to the hard-hit southwestern part of the state. New Jersey was placed under a state of emergency Monday as more than 1,400 residents were evacuated due to flooding from over a day of heavy rains and strong winds from a potent nor'easter. With several major rivers and streams overflowing their banks, acting Gov. Richard Codey declared the emergency, giving him extra powers to handle storm-related problems. Codey urged residents to stay home from work and off the roads, if possible. However, the number of evacuations due to flooding was growing by the hour, Codey said, and up to 40,000 people were without power. More than 780,000 homes and businesses had lost power from Maine to North Carolina, where some 235,000 customers were blacked out. Public Service Company of New Hampshire said some of its customers could be without power for several days because roads were washed out. Pounding waves completely covered the beach at Hampton Beach, N.H.
"We went to look, but the wind was so strong that you couldn't walk. ... The wind just turned you back," said Linda Pepin of Bristol, Conn., who owns a condominium less than 50 feet from the Hampton Beach shore. 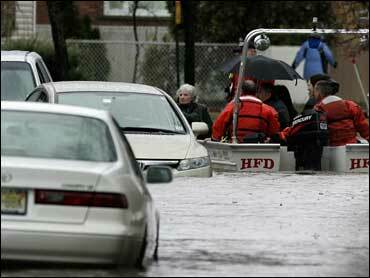 More than 1,400 New Jersey residents were evacuated because of flooding. Elsewhere, however, hundreds of evacuees were allowed to return home Monday at Hamlin, W.Va., after officials determined that an unstable earthen dam was no long in danger of bursting. Crews had pumped thousands of gallons of water from the lake formed by the privately built dam and lowered the lake by 6 feet, said Lincoln County Emergency Services Director Allen Holder. Fierce wind toppled trees onto a northern New Hampshire highway as Bob Eastman was driving through on Monday morning. "It was a wonder it didn't blow you off the road," he said. Coastal residents were urged to evacuate in parts of Maine, and a nursing home in Portland was evacuated as a precaution, state officials said. In southeastern New Hampshire, parts of downtown Newmarket were evacuated because of flooding. Flights were delayed Monday at Boston and the New York area's three major airports, where airlines canceled some 600 flights Sunday as wind gusted to 48 mph, according to the Port Authority of New York and New Jersey. Amtrak's Downeaster suspended service in Maine because tracks were washed out in Berwick. Flooding delayed or canceled Amtrak service between Boston and Washington. At Union City, N.J., a large section of a 4-foot-thick, 50-foot-high stone wall collapsed onto a busy road during the night, and rescue workers used heavy machinery and dogs Monday to see if any cars had been buried. "There could be, and that's the assumption we have to operate under," said David Curtis, deputy chief of North Hudson Regional Fire and Rescue. One person died in a car stalled in deep water in an underpass in New Jersey, one person was killed by a tornado in South Carolina, and two died in car accidents — one in upstate New York and one in Connecticut. The same storm was blamed for five deaths earlier in Texas and Kansas.